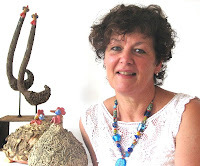 Opening this week at Maleny Artworks Gallery is a fascinating exhibition by well-known Maleny clayworker Mieke van Sambeeck. The show is titled “Incurable Passion” and is a display of some 80 clay chooks – all with their own story to tell and all with their own quirky postures and personalities. Mieke has had a passion for making chickens for several years and in pushing the medium boundaries, has come up with some intriguing and very pleasing results. Probably best known for her recent raku and horsehair pottery, Mieke is now experimenting with a variety of matt glazes and the addition of other elements such as rust and various wax finishes to produce quite unique artworks. It’s always exciting to follow established artists who stretch themselves outside the boundaries of their arts practices, and Mieke is certainly one such artist whose works are high on the list of worthwhile collectable art. Her show runs through December and January.